Did you know that Idaho has over 30,000 miles of dirt and two-track roads? This makes our state the ideal place to own and ride a dual sport motorcycle. It's possible to traverse the state of Idaho from the Nevada state line to the Canadian border while keeping your wheels almost entirely in the dirt. That's over 1100 miles of adventure! It's no mystery why people in the know refer to Idaho as a mecca for adventure motorcyclists. In case you're not familiar with the term adventure riding, let us explain. 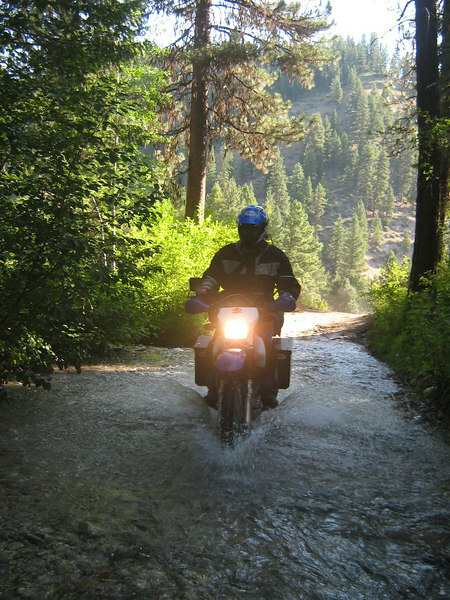 Any type of travel on a motorcycle can be adventure riding. It doesn't matter if you're on a multi-day tour on the tarmac or combining those paved roads with dirt, gravel, two-track roads or goat trails. An author named Gilbert Chesterton once wrote that "An adventure is only an inconvenience rightly considered. An inconvenience is only an adventure wrongly considered". So, it's not your bike or your skill level - it's your attitude that makes you an adventure rider. Having said all that, you will find that most of our members prefer the solitude, challenge, and excitement of Idaho's beautiful back-country. Public Awareness. One major goal of IAMC is to raise positive perception and awareness of dual sport riding. We promote responsibility and shared maintenance of the trails, roads, and areas we ride. Hopefully this will improve riders' relationships with land owners and managers. Social Responsibility. Hosting fund raising events and being active members of our communities can further improve public opinion of motorcycling. Knowing each other. We meet once monthly in the Treasure Valley area to plan, socialize, and of course...ride! We strive to make club rides safe and fun for all participants. Riding together. 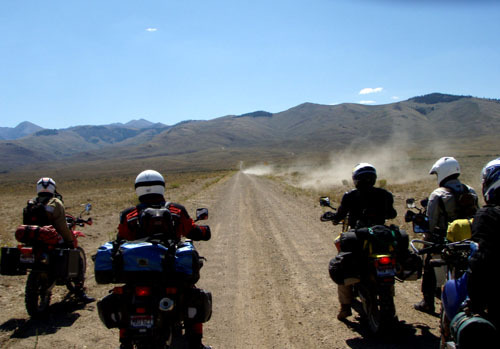 Idaho Adventure Motorcycle Club hosts at least one major ride each year. Smaller club rides will be held almost every month. We will also plan one annual fundraising ride to support a local charity. At these club events members can develop their riding skills and find plenty of riding buddies for future outings. You can benefit from an IAMC membership in many ways. Form friendships with other riders who share your interests. Learn from other experienced riders and share your experiences with us. Discover new roads and destinations in Idaho and beyond. Increase your technical skills with workshops and tech days. Plan and participate in dual sport rides. Please explore our website and learn about the great things that IAMC has to offer. We welcome new members and look forward to meeting you!